Are you ready for the holidays? No? 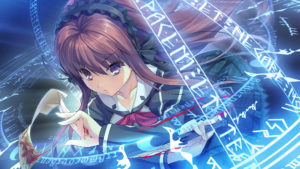 Well then you’re in luck, you might just be interested in the newly released A Clockwork Ley-Line: The Borderline of Dusk. Other news this week include new title announcements by Whirlpool and Azurite, as well as teasers by various other Japanese companies, including MintCube. We’re also getting closer to a new title announcement by Favorite, so definitely keep an eye out. The English release for the first entry in the Ley-Line series has been decided. In fact, it has already been released as of yesterday! A Clockwork Ley-Line: The Borderline of Dusk is now available on Steam in an all-ages edition, or over at Denpasoft for the adult edition. 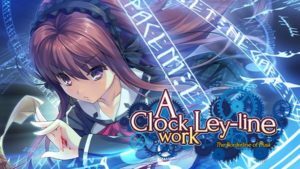 In A Clockwork Ley-Line, you play through the eyes of Koga Michiru as he gets to work for the school’s “Bureau for the Investigation of Special Affairs.”. Mangagamer (NSFW) currently has a XXXmas sale with large discounts on major titles, including Rance VI + 5D and Beat Blades Haruka. DLC character stories for Lupiesoft’s Mutiny are now also available. Whirlpool has announced a prequel to Neko-nin exHeart, logically named Neko-nin exHeart 2. A website was already opened as well, and the release date has currently been set to March 30. 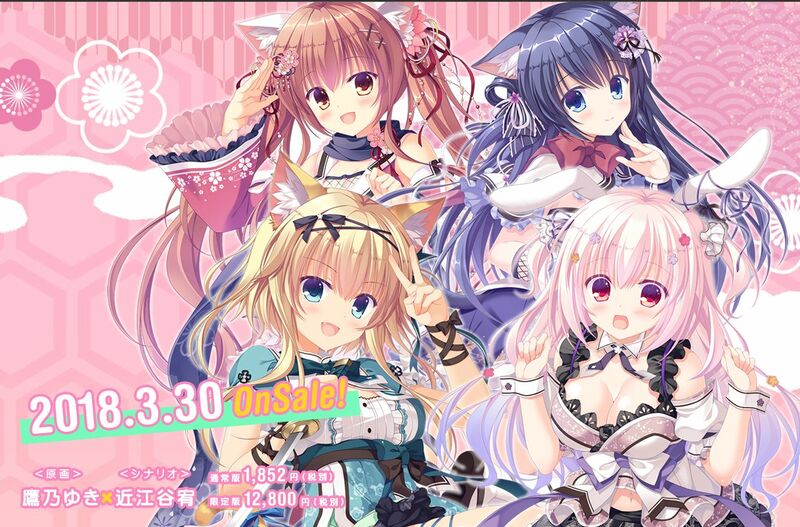 You might know Neko-nin exHeart from its similarly named English release through collaboration with Sekai Project and Denpasoft. So far nothing has been announced regarding a translation of this latest title however. Takano Yuki will once again work on the art for Neko-nin exHeart 2, with Oumiya Yuu as the story writer. 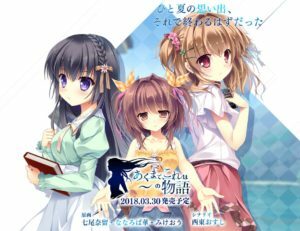 Collaboration company Azurite opened the website for a new visual novel called Akumade, Kore wa ~ no Monogatari. Their 2nd title. To be released in March next year. This new title will feature graphic work by renowned artists Nanao Naru, Mikeou, and Nanaroba Hana. And a story written by new name Saitou Osushi. The website currently features a story page, character pages for the main heroines, and a release information page. MintCube has published a teaser for their 3rd title called Yuusha to Maou to, Majo no Cafe. The full website will be opened in just a few days, on December 22. Nothing else is known about this title as of now. MintCube is part of the same parent brand that companies like Cube and Hulotte belong to. Tinkle Position will open the website for their new project on December 28. BaseSon published a teaser page for the the latest Shin Koihime † Musou title. Akabei Soft’s Bosei Kanojo will release on March 30. They also announced a new title called AI Love: Koi Suru Otome wa Kikai Shikake. Digital Cute will release a special 10th anniversary package in January (Website here). Leaf will release a White Album 2 Extended Edition in February. Favorite will publish information on a new title in a few days. Giga released the trial for Soi Kano. Alcot released the trial for Shougun-sama wa Otoshigoro. 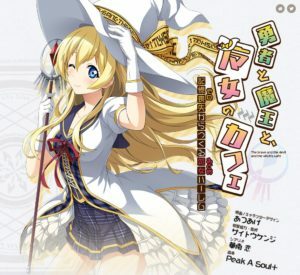 Canvas+Garden released the OP for Koi ni, Kanmi o Soete (Youtube). Alicesoft released a new Rance game compilation movie (Youtube). Harukaze released patch 1.03 for Nora to Oujo to Noraneko Heart 2. Milk Factory Motto Haramase’s release date has been set to April 27. Atelier Sakura released a trial for Tsuma ga Karada o Hiraku Wake.